Cousins Little Misses A and S have spent some time together lately. While you couldn't say that they play together, they do interact and have fun. Family times in the park with Auntie Ashley, trying on Grandpa's hat, and eating pizza provide this Nana with great photo ops. Miss A loves to ride Miss S's car while the owner, not yet able to walk on her own, hangs on for dear life as they careen around the house. Cousins can be such fun! I know, for I have 56 of the first cousin sort! Blueberries are ripening in our garden. The bushes are loaded this year, more than I've ever seen. Yesterday I picked 5 pounds and there's lots more to come. These summer days are so filled with joy. Not all is rosy, but I am thankful for the positives and trust God for the things that aren't so easy just now. How is your summer so far? I hope there are good things to focus on in your days. Cute little cousins! They are adorable. I also have a great crop of blueberries but, I think the birds a getting most of the ripe berries. Wonderful mosaic, have a happy week ahead! So I'm hoping for some good blueberry recipes over here. It's nearly blueberry season here as well and they are my very favorites. I might actually make myself a pie this year. Why do we deny ourselves? I have never made myself a blueberry pie. Not even once. Oh yes, a cousin is always more fun than your own sibling. Our blueberries should be ready soon too, love to eat them and freeze lots for the winter. Wow blueberries from your own garden. Yummy!! Your granddaughters are so cute. Blessing! Lorrie you beat my in the Cousin Race - I only have 54! 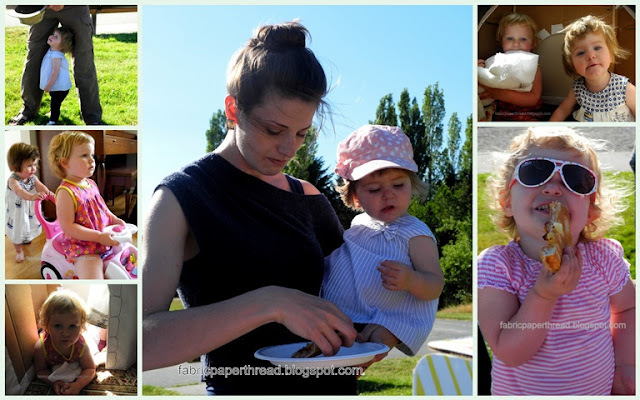 Lovely shots of the sweet little Misses! 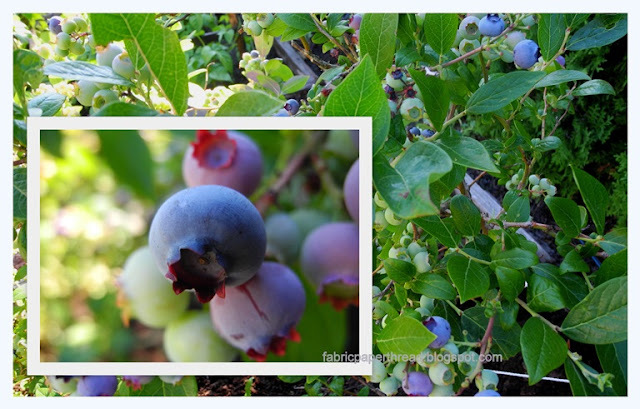 What lovely photos - I love blueberries and that closeup shot is fantastic, such a lovely shade of purply blue. Lovely family photo's for you all to cherish. I'm very impressed by your blueberry harvest I'll be lucky to get enough for one batch of muffins. Great shot of the blueberries and I love the way you did the mosaic. You gave me ideas. Enjoy your week. I just love this time of year with the berries ready to pick. Blueberries, oh yum! Your little ones are so cute. We get to have both our granddaughters here (with their moms) week after next, and we can't wait to watch the cousins interacting. I've got a huge number of cousins as well (~50 on EACH side, my parents each having 9 siblings! ), but I really never spent much time with them, sadly, as we lived too far apart. Big reunion coming up this summer though, and I'm looking forward to getting to know a few better. It looks like you're having plenty of family fun, Lorrie. The blueberries look so tasty! I can't believe you have your own blueberry bushes!!! That is awesome! You have 56 first cousins? Oh my gosh!!! That is incredible!!! Happy summer! I loved playing with my cousins when we were young. We had the best times together! We still get together when time permits. And, of course, who doesn't love blueberries. Those little gals are sweet!! I'm glad the good is carrying you through the rough. There is a bit of that here too. Very nice photo collage of the kids--SO cute! Some of our blueberries have ripened and we've been eating them for awhile now...although they never make it inside the house because they are so yummy! I'm glad that you are having a lovely summer! Ours have been on a weird side, to say the least, LOL. How lovely and what a Blessing.